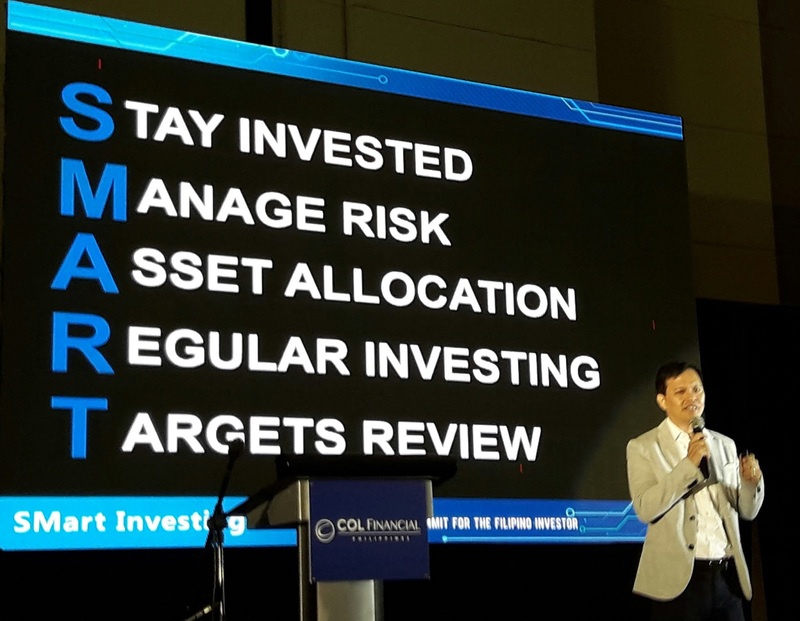 Sharing with you a condensed and combined version of Jed Velarde’s and Marvin Fausto’s talk during the COL Financial Smart Investing 2016 Summit. Plus some of my additional inputs. To safeguard your money against inflation (which erodes your money’s purchasing power over time). To let money work for you. We only have a limited time to work for money, at some point, our money should also work for us to create more money (interest, dividends, capital appreciation etc). At some point, our money should work harder than us. To be financially free. To secure a comfortable future. To have a richer life. To use our God-given resources and talents. To have more than enough to share with other people and bless them with richer lives as well. This means as much as possible, part of your savings (or assets) remains invested at any given time. From your first pay check up to past your retirement years. Which means you should not invest all of your money. You should not invest part of your money which you think you will need in the short to medium term. Hence, you start first with building your emergency funds and leave a certain amount in a liquid deposit account for your daily needs. Then invest the rest. Staying invested also means investing in the long run, for the long-term. Through the market ups and downs. Warren Buffet’s rule #1 is: “Do not lose money.” Don’t be reckless in investing. Since there is opportunity to gain in investing, there is also opportunity to lose. That’s why many people don’t like to invest because of fear of losing money. But if risk is properly managed, the chances of your investments growing outweigh the downside risks. Besides, not investing your money is a sure way to lose money (due to inflation). Here in investmentjuan01, we always ask you to pair each of your investments with O-H-A (Objectives, Horizon, Appetite). Invest according to your goal and objectives. You manage risks by educating yourself of the various investments (like which stocks you purchase), or letting experts do the investing or you (like buying various mutual funds or UITF, which suits your OHA). As others say, Aral muna bago invest. You manage risks by having the proper time horizon. Part of managing risks of your investments is asset allocation. Diversification. Investments are governed with cycles just like in business, there will be good years and not-so-good years. Invest in various vehicles so that you minimize concentration risk, so that you allow good performing investments to compensate for not-so-good performing ones. Click here for various investment options we cover. John Bogle, founder of Vanguard Group (among the largest fund houses in the world) says that you allocate your age in bonds, the rest in stocks. So if you’re 30 years old, he says 30% of your investable funds should be in bonds (or money markets / fixed income), 70% in stocks. Of course there are no hard and fast rules. Marvin Fausto recommends below asset allocation depending on your age and phase in life. Blue slice is stocks, gray slice is bonds. Aside from staying invested, a smart investing technique is to invest regularly, in fixed intervals. Not one time big time, but regularly, in comfortable amounts. This makes Juan disciplined in handling his monthly paycheck and later on he won’t even feel the amount he invests, the amount leaving his salary for a good cause. Through investing regularly, Juan is able to take advantage of cost-averaging, being able to buy in the highs and lows of the market, hopefully to end up with a lower average price than market value (hence a gain). Seasoned traders and investors might have reservations with regards to this because they themselves are more familiar in timing the markets (position trading), and because they can outperform the returns of cost-averaging. But not everyone can be like them. For newbies (or those who neither have the time to monitor the markets nor the skills and confidence to frequently buy and sell), cost-averaging through regular investing is highly recommended. Personally I do this for my VUL and UITF, then I do position trading in stocks. Online brokers (COL Financial, among others), mutual funds, and banks (UITF) also have programs to cater to regular investing (easy investment plan, monthly investments plan, whatever they are called), some even through salary deduction. They want to make investing easier for every Juan so do take advantage of those. We have also seen that investing as early as possible (no matter how small the amount is) can yield to a bigger fund in the long run (thanks to the power of compounding) compared to those who start investing late. What matters more is the length of time you allow your investments to grow, than waiting for yourself to have a bigger salary but starting much later on in life. As mentioned, your investments should be paired with objectives. As such, you must set aside a time each month or at least each year to assess whether your investments are trending according to your targets. Likewise, a re-allocation may also be done to adjust your asset allocation according to your age and changing needs. This is especially true if Juan is nearing retirement, then Juan must slowly bring down his exposure to stocks and shift these to lower risk bonds and money markets. Again, your age in bonds as Bogle says. It is also good to set aside specific times to assess other investment options as you grow your portfolio. If you care about your future, if you want a richer life for you and your future family, invest. Invest the smart way. For highlights and notes on the COL Financial SMart Investing 2016 summit, click here. Share this article with a friend and help them in their own investments. Follow us on Facebook, Instagram and Twitter. Join our growing subscriber base for free. Check out Bo Sanchez’s Truly Rich Club and the many financial and spiritual benefits that we enjoy as members. Support our cause, donate through Paypal.